White Rose Cottage is a charming and newly refurbished self-contained cottage, adjacent to the owners' home and set in peaceful grounds of more than 9 acres, including garden, fields, paddock and a lake. 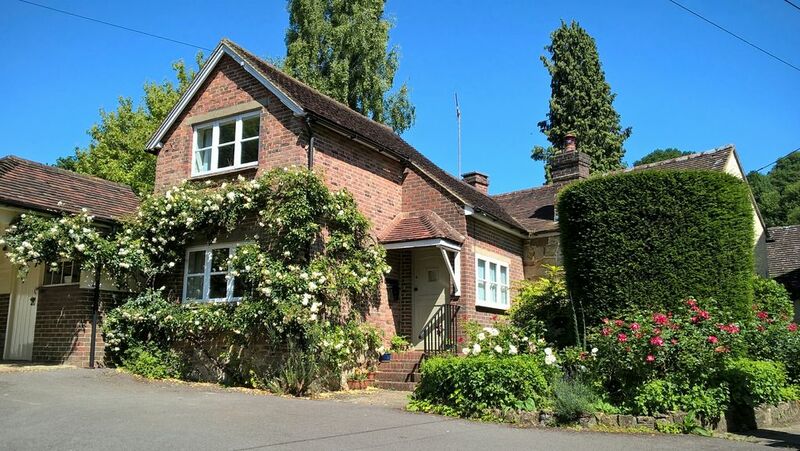 Beautifully presented throughout, White Rose Cottage is ideally located to explore Ashdown Forest and the South Downs, National Trust houses and stunning gardens, preserved railways, the historic towns of Lewes, East Grinstead and Tunbridge Wells as well as the south coast. The accommodation is set over three levels, offering a spacious double bedroom upstairs with 500 thread count sheets and Sanderson bedding. There is ample space in the bedroom for a cot, which can be provided on request. On the ground floor, additional guests can be accommodated in the sitting room which is provided with a 43" internet enabled (4K) flat screen TV, DVD player and comfortable seating, including a sofa bed with deluxe mattress (small double). Also on the ground floor is a modern bathroom offering a full size bath, with shower over, glass bath screen, WC and a washbasin. The heated towel rail will keep your fluffy Egyptian cotton towels warm and dry. Stairs lead from the ground floor up to a further room with dining table and four chairs, two armchairs and a 32" flat screen TV, in case sleeping guests are occupying the main sitting room. Next to the dining room/second seating area is a modern well equipped fitted kitchen with electric oven and hob, fridge with freezer box, dishwasher, microwave, toaster, kettle and a wide range of cooking utensils, crockery and glassware. Guests are welcome to eat in the garden, immediately outside the cottage's back door and to make use of the cottage's BBQ. If dining out holds more appeal, the cottage is a few minutes' walk from an award winning pub offering excellent food prepared from locally sourced ingredients; and just a short drive from several other local pubs and restaurants. Access is provided to a utility room (5m outside the cottage) with washing machine, tumble dryer, iron, ironing board and drying racks. There is ample space to park directly outside the cottage. WiFi is available throughout the cottage and is free of charge. Oil central heating. All linen included. No smoking or pets. Bike storage available. Children's highchairs, cots, changing mat and stair gates available on request. We moved our family to this Area of Outstanding Natural Beauty in summer 2015 after 15 years living in London. We have settled very quickly into village life. Our idyllic location allows daily commuting to London in just over 1 hour but a restful time at home, enjoying generally very good weather (different to my native Scotland!) and the stunning rural setting of a wooded valley. Our home, Avenings Farm and White Rose Cottage next door are set in more than 9 acres of land, allowing us the space to grow our own fruit and vegetables and a local farmer to keep his sheep in our field. We also have a rowing boat which can be used on our small lake and an enclosed (to keep the sheep out!) 5-a-side football pitch with goals. Modern bathroom with white bathroom suite; full size bath with shower over, glass shower screen, vanity basin with large mirror, cistern toilet (mains drainage) and heated towel rail. Outside of cottage in separate utility room, 5m from cottage. The cottage is set over 3 levels and has steps to reach all parts. A very warm welcome from Caroline. Everything was explained fully.The cottage had everything we needed and was set in a beautiful location. I enjoyed a nice walk down to the lake. Beautiful cottage with very friendly and helpful owners. We loved our stay in this cosy and beautiful cottage. It's very clean and has everything you need for a perfect holiday. The area is great with interesting places to visit. A very well equipped cottage with lots of unexpected extras [ including fruit.eggs.jam } , Caroline and Paul were always available for any help or advice.The cottage is set in lovely surroundings which we were free to explore and well situated for many places of interest in the area. An immaculate property! Comfortable , pretty, contemporary and a delight to enjoy!! Caroline and Paul were wonderful hosts and Rose Cottage is a perfect country retreat! Our hosts were welcoming and generous with the little extras (breakfast treats, fresh fruit and homemade jams, picnic set, a fully equipped kitchen, tourist guide books, games, movies etc..) and nothing was a bother. The gardens, play areas and lake are perfect for exploring and the outdoor area is lovely and private for an evening meal or cuppa! We were looking for a quiet retreat to escape the business of life and we could not have been happier! A wonderful location for exploring the Sussex region or simply tucking yourself away in the country. We hope to be back one day!! Welcoming, comfortable and well equipped cottage ideally situated to explore Ashdown Forest and local NT properties. We were supplied with a generous basket of local produce which set us up for a very pleasant few days. Charming Cottage, made to feel very welcome. A lovely cottage, great weather, great pub and excellent Farmhouse Cider! Travel: London can be reached by train from Haywards Heath or East Grinstead main line stations in less than 1 hour. Gatwick Airport is 30 minutes away. White Rose Cottage is on a bus route (Metrobus 270), but to get the most from this stunning area, a car is recommended. Walking/hiking/horse riding: there are dozens of walks in the beautiful Ashdown Forest on our door step and also the South Downs are easily accessible. There are local riding stables offering hacking on the Forest. Historic properties/stunning gardens: there are more than 25 National Trust properties and fantastic gardens which can be reached in under one hour. The closest - Sheffield Park is less than 5 minutes away. Preserved railways: we often hear the whistle from the Bluebell Railway steam trains while in the garden as the closest station is only 2 miles away. The Spa Valley Railway is also close by. Places of interest: Brighton, Lewes and Tunbridge Wells are all nearby. Grocery shopping can be done in Haywards Heath, East Grinstead and Uckfield. Eating: There is an excellent traditional local pub a few minutes walk away. The Coach and Horses serves cask ales and award winning food. There is a roaring fire in winter and a large garden to enjoy in the summer.